With All My Might – Peachtree Publishing Company Inc. 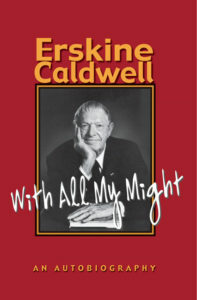 In With All My Might, his definitive autobiography, Caldwell tells about his work as a cotton picker, stagehand, professional football player, and war correspondent for Life magazine during World War II. In 1932, Erskine Caldwell’s first novel, Tobacco Road, was the center of controversy. Some critics condemned the book; others considered it to be the work of a genius. Today Caldwell’s fifty-plus books have sold more than 80 million copies worldwide, and his stature as a writer has been firmly established. In With All My Might, his definitive autobiography, Caldwell tells about his work as a cotton picker, stagehand, professional football player, and war correspondent for Life magazine during World War II. He describes his four marriages (including the much-publicized divorce from photographer Margaret Bourke-White). He writes of the sacrifices he made and the rejections he suffered during the years he was struggling to have his work published.